At Wentworth Island Lake we have built a small log cabin for rent exclusively for our customers. Whether you’re looking for a value-retaining capital investment or an idyllic holiday home – our portal offers investment a number of serious options for buying property in Canada. With us, prospective customers buy developed land, which we own ourselves. 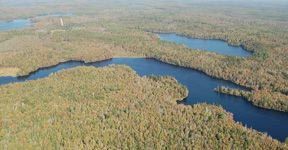 With 20 years’ experience in sales of lakeside land in the Canadian province of Nova Scotia, a transparent, secure purchase process is guaranteed. All property prices are fully inclusive, and include all costs and fees. The new highlight of our portfolio. You can now parcel your property individually. Parceling between 1ha and 30ha. Fully developed. Unique conditions. We offer an excellent choice of larger than average properties in the middle of Nova Scotia. 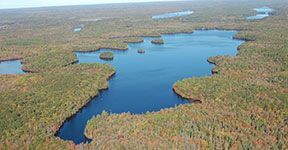 You can purchase several hundreds of hectares of land with a private lake, and all at an affordable price. You will find your dream property in Canada for quite a low price. Already developed and at any time constructible breathtaking forest and lakeside lots are waiting to become an investment or a holiday home. For many people, Canada is the epitome of nature, wilderness and adventure. The second largest country of the world in terms of area awakens a burning desire and is a popular tourist destination. And if you are also seized by wanderlust, our company is the right place for you. We have been selling real estate in Canada for 20 years specializing in southern Nova Scotia. Unlike many other companies, we are owners of the lots we offer and also the direct contact! On our portal you will find wonderful investment opportunities in Canada that are perfect fort a capital investment or holiday home. Arno Schmidhammer, an enthusiastic sportsman and nature lover, and Gary Belliveau, who has been doing business in construction and earth moving sector since 1985, are your competent partners who will help you purchase attractive properties and lakeside lots in Canada. Our prices are all-inclusive and include all costs and fees associated with the purchase. Since our offer is being constantly updated, it is worth checking back with us regularly. You might find the residence of your dreams. Our portal offers dream sites without obligation to build, and attractive houses in the stunning lakeland area in the south of the province of Nova Scotia. From lakeland sites with a beautiful lakeside frontage to idyllic forest plots, our large sites offer investors versatile options for constructing profitable holiday homes. Migrants who are looking for a fulfilled, natural life will find building plots of various sizes with a good connection to the infrastructure network. The combination of building plots at moderate land prices, low energy costs and the openness of a country that welcomes migrants guarantees modern pioneers the ideal start to a self-determined life. Attractive property in Canada, such as holiday homes, is another area of focus in our offering. A wooden house with its own mooring for a boat, in front of the magnificent natural backdrop of Nova Scotia, is an investment which will maintain its value, and is worth the journey at any time of the year. Nova Scotia is the most easterly of the Canadian provinces, and the second smallest. The sea is ever present on the peninsula, and easy to get to from any location. Glorious coastal areas with fabulous fishing villages and lonely sandy beaches, wonderfully situated lakes and extensive nature conservation areas shape the character of the region. At the same time, Nova Scotia offers all the convenience of modern infrastructure such as educational facilities, hospitals, an extensive road network and airports with excellent connections to Europe. A moderate climate gives a Mediterranean summer pleasant temperatures for swimming. The world-famous “Indian Summer” arrives from the middle of September, displaying its full glory in the mixed forests. Nature at its most pure, quirky towns such as Halifax, fantastic food and hospitable people make Nova Scotia one of the best places to be. The perfect location for your property. Forest, lakes, the ocean and excellent infrastructure – Nova Scotia has a lot to offer. If you want to live the dream and take advantage of a sound investment, you will find land and houses in the best locations, at all-inclusive prices, in our portal. Whether it’s an investment, holiday home, main home or for retirement, property in Canada is a sound financial investment, with a high quality of life. In contrast to other companies, we ourselves are the owners of the properties on offer, and also your direct contact! Arno Schmidhammer, keen sportsman and nature lover, and Gary Belliveau, who has been involved in the construction and earth-moving industries since 1985, are your highly-competent partners for your purchase of attractive property and lakeside land in Canada. As we are constantly adding to our portfolio, it is always worth dropping in for a look. Perhaps you will find your dream home. The financial crisis, the crisis with the Euro, ongoing concerns over inflation, and a huge mountain of debt in Europe and the USA have triggered significant demand for property in Canada. The “best country on Earth” according to UNO, possesses one of the most solid financial markets in the world, a booming economy, large reserves of raw materials and very positive future prospects. A strong Canadian dollar and a solid banking system provide the ideal conditions for purchasing real estate in Nova Scotia. With a capital investment at moderate property prices, in a stable economy, investors can find a safe haven for their financial assets. But it’s not just the economic advantages that attract people to Nova Scotia. Anyone who has ever spent a holiday in a log cabin by a Canadian lake will never forget that scent of freedom and adventure. A clean environment, social security, and plenty of space for your private life make this natural paradise a dream destination for stressed Europeans. The water samples taken in April 2018 were tested for phosphate and nitrate. The investigations indicate the lowest values, which are about 1000 times smaller than the permitted values for drinking water in Austria. The south of Nova Scotia has no factories and larger farms, leaving the water unencumbered.